I read this article in the Guardian today, about soul cakes passed out on All Soul’s Day. Possibly the origins of trick-or-treating. It appealed to me in so many ways! For one, I love that food might have magical powers. If you eat these cakes, you send a soul to heaven!! That’s power! I think there are a lot of superstitions about food, particularly around different holidays. Can you think of any? I also like the idea of soul. I love soul music, and soul food. And the idea that there is something bright and beautiful and transcendent that we don’t quite understand. Here’s my playlist of beautiful songs with soul in the title. And here’s a link to my favorite new blog with the soul cakes recipe. This entry was posted in Uncategorized and tagged all souls day., soul cakes, soul food, soul music by Claire. Bookmark the permalink. You need Peter, Paul and Mary too! I’m sure there are a million others! And probably a million soul-ful songs that don’t have the word in the title. THis is a nice one, though! 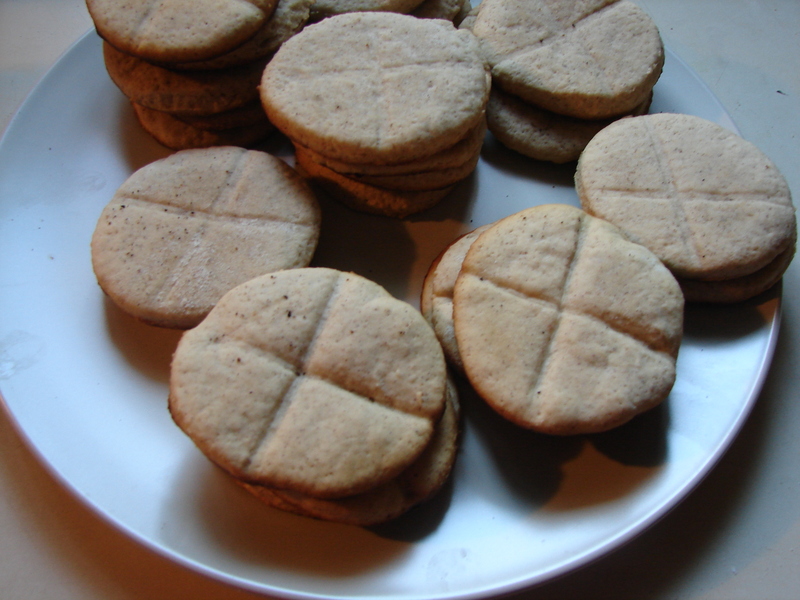 Soul cakes in our part of the country were, and have always been, the same as a Hot cross bun (but without Raisons and the cross) so a puritan bun. The alternative is apple cake .. that was to do with using the apples that couldn’t be stored… no wastage of precious food stuffs here. When we moved back to Norwich we served the apple cake to the trick or treaters – the city kids didn’t get it.. slightly disturbed that something healthy might pass their lips! I’m a country lad – whose lived on farms with fruit trees most of my life … we were always told hallowe’en was based on the ‘souling rhyme’. Poor Men and children would go knocking door to door on the rich folks house and sing to each – for a soul cake (like a hot cross bun) or strong beer. It’s been a folk tune for hundreds of years and changes slightly from place to place. We’ll come no more a-souling until this time next year. If you haven’t got a ha’ penny, then God bless you. I think it was Catholic – giving to Peter was to do with fleecing people for building churches! Anyway, when I was a kid in the ’70 it had nothing to do with religion and everything to do with our dads getting wreaked on scrumpy while in charge of the kids for the evening. Any Good Thing To Make Us All Merry”. My Great Grandmother was the village keeper of all things traditional – mostly to do with food and drink.. but as she couldn’t read or write – lots of the recipes died with her – but the funniest think about her obituary in the local paper was the sadness in the loss of all the wine and cider techniques – the writer may well have headlined it “the brewery has gone to heaven”. Somewhere I have approximations of the Soul Cake (bun style) recipes. It’s so funny – my conscious brain didn’t make the connection between your response to TFD and the soul cakes, but my unconscious did, because I woke up with the song in my head, and I thought of your comment and said, “HEY!” I just love the song/poem. (And your spill version) I think I must have read it years ago when I became obsessed with reading Mother Goose-y rhymes, and learning about their origins. Here in America we can’t give out baked goods, because nobody will eat something that hasn’t been tamper-proof-sealed, for fear of razors or poison. Sad but true! And I’d love to see the bun style recipe, if you can find it.